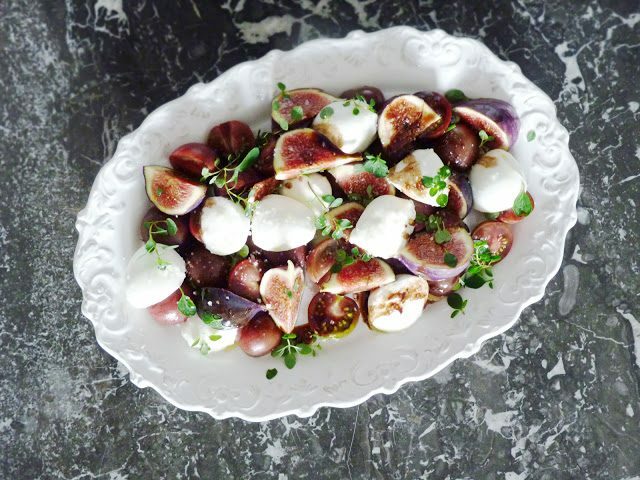 What better and refreshing way to celebrate a summer vacation than whipping up a crisp salad while sailing from port to port... black figs, heirloom tomato halves and buffalo mozzarella Caprese balls with a thyme-honey dressing and fresh oregano. Cheers to summer from Scarlett over at Fork and Flower! Ingredients: 2 black figs, in eighth 1 cup heirloom cherry tomatoes, halved 1 pack buffalo mozzarella globes handful oregano leaves 1 tsp. maldon sea salt 1 pinch freshly ground black pepper 1 tsp. thyme-honey 1 tbsp. fig balsamic vinegar 1 tbsp. extra virgin olive oil Directions: Assemble the figs, heirloom tomatoes halves and mozzarella on a plate, adorn with the oregano. sprinkle with salt and pepper. make a quick dressing with the honey, olive oil and balsamic vinegar, and drizzle on top. Click here to see the original post from Fork & Flower.